1st Floor Elegant Garden apartment, on the beach, short drive to rainforest, 30 minutes from San Juan (airport). All 5 star reviews. Wi-Fi Free! 24 hour security Complex includes two pools, tennis court, basketball court, golf green, kids playground, sand soccer field. Master bedroom with Queen size bed, walk-in closet and full bath. Living room with slide out futon. Equipment: Air conditioning troughout all areas, Washer and dryer, Full kitchen with Wine cooler, Dishwasher, Microwave, toaster oven, Fridge/Freezer with ice maker, water heater, 2 TV with 2 DVD player, stereo with iPod hookup, Bar-B-Q. Newly installed water purifier. I really wanted to give 5 starts but there were a few issues. I would suggest just a few very easy updates for 5 stars. -beach was beautiful/clean; complex exterior/landscape was great and pool was also clean. -apartment/complex was quiet/clean, A/C worked great and all appliances. Bring a hand pump for the basketball and soccer balls if you plan on playing. 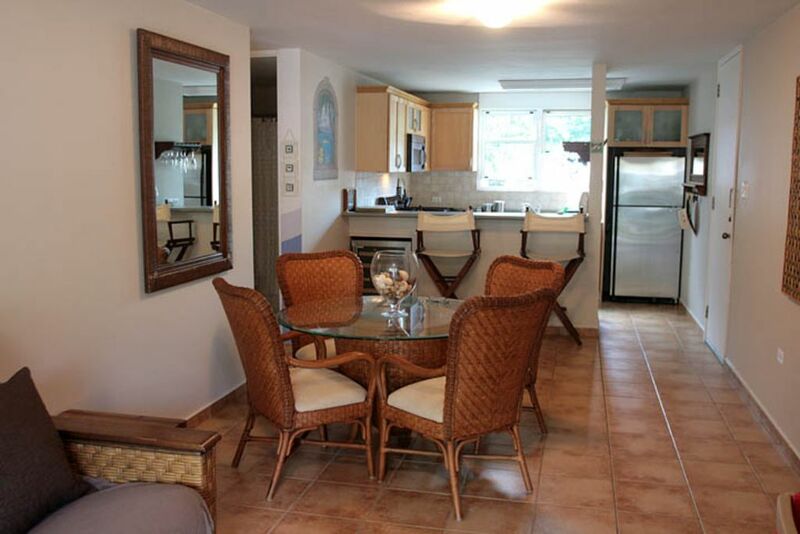 -very close to restaurants,shopping and rainforest. -if you are active I felt very safe running to the Wyndham and back solo. -beach is extremely quite which was great - max we saw at one time was maybe 8 people. -back sliding door and back windows did not lock so we had to often use the storm shutters when leaving and at night - when I texted about this the owner noted that the apartment complex was safe but we didn't want to risk anything - Safety for our family in an unfamiliar area is important to us. -no bunk beds per property details - only a full size and toddler bed in spare. Both adults had to sleep on the pull out futon in the living room as we didn't want our kids to be in that area at night (also with concerns of doors and windows not locking). We figured out how to turn the deadbolt all the way the last night but only used the door handle lock the previous days which was not very tight. Owner noted when we left that when we put the futon up it was adjusted in a different position than what it was originally as a sofa. Since futons are adjustable we tried to make sure it was very close to original position - would suggest marking/advising the correct setting for future renters if needing to use as a bed. We didn't want to use the futon to begin with though (not as comfy as a bed) so having bunk beds would have avoided us using to begin with. -pool is for lounging only - we have two older kids and we were all in the pool quietly playing being very respectful and were told no playing in the pool and no toys once we reviewed the rules that were posted on the building - we never returned to the pool after that. Our goal and commitment are for our guest to have an excellent vacation that will be cherished forever. We are sorry to learn about the little things like batteries and air pumps that could have been fixed if we had discovered about it during our daily communication via text, we have already taken care of those. We appreciate your note since it helps us keep improving our vacation rental service. There is no safety issue in Bosque del Mar, the apartment has shutters which complements. Pool rules are set by the Complex, not owners, to ensure everyone can enjoy the facilities. We did have to fix the futon that was broken, so no worries about cost, we hope you enjoyed Puerto Rico and all the entertaining things we have to offer. The property is quiet, clean & tidy with great access to beautiful private beach. Feels very safe. Jose checks in regularly via text to ensure all is well and provide recommendations for places to eat and things to do. Convenient location for access to Luquillo Kiosks, El Yunque National Forest & to Ceiba / Vieques Ferry among other things. I would stay at this location again and recommend it to my friends. Thank you for taking the time to review our property, glad you enjoyed Puerto Rico! The property was great! Clean, well stocked, safe, beautiful beach and grounds, and a great host. Check in was exactly as described. The grounds are very nice, especially the beach! The apartment was spacious and well stocked. Plenty of cooking ware and many of the basics (salt, pepper, adobo, etc). It was spotless and everything worked well. The host was proactive in communicating well before we arrived and during our stay. There are two parking spaces available in front of the apartment. The host thought of everything, even a small cart to take toys and refreshments to the beach. Beautiful beachfront property. Clean and quiet location. This condo is small but comfortable. Best part is the beach is steps from your door and you're minutes from El Yunque, also. Would definetly stay here again. The apartment was clean, secure and family friendly. 5min walk to pool and beach. The owner was helpful and everything was provided. Had a wonderful stay. Would recommend. Bosque del Mar is a wonderful, clean complex with direct access to a perfect beach. Pictures don't do justice to the natural beauty of this clean aquamarine warm water, smooth yellow sand miles long uninterrupted , well maintained but not overly developed beach. Complex is kids friendly, family oriented. Owner, Jose Bolivar, was very responsive and accommodating. Rainforest, horseback riding, go-Karts, Bio-luminiscent bay in kayak, outlet shopping, great restaurants and local flavor. Weekly rentals get 10% Discount of nightly Rate. 14 night Rentals get a 15% Discount of nightly Rate. Monthly rates also available at additional discount of 25%. Rates are subject to change until deposit is collected.